PTFE coated fabrics combine the non stick and heat resistance of polytetrafluoroethylene(also known as ptfe), with the strength and dimensional stability of fiberglass, creating a coated fabric suited for a variety of demanding civil and industrial applications. Dimensionally stabile in a range of temperatures from -73°C-288°C,our ptfe coated fabrics is non-toxic, odorless, tasteless, and is FDA and LFGB compliant for use in ptfe coated fabrics food processing, packaging and handling. 5. ptfe coated fabrics Used as covering or wrapping material in petroleum, chemical industries, as wrapping material, insulating material, high temperature resistance material in electrical industries, desulfurizing material in power plant ect. 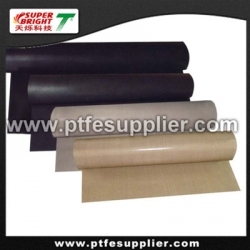 6. ptfe coated fabrics in food industry: used as non-stick oven liner, BBq liner ,cooking liner and so on. The ptfe coated fabrics is not only can be used to make conveyor belt , but also can be applied in food industry , such as non-stick oven liner , non-stick cooking liner , BBQ liner and so on.